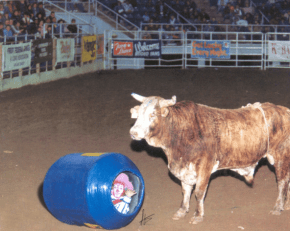 Cedar Park is where the rodeo and bull riding action is going down this weekend (June 21-23, 2013). Diamond Cross Rodeo is producing a CPRA Rodeo on Friday and Saturday nights and then a PBR event on Sunday afternoon at the beautiful Cedar Park Center. Performances on Friday and Saturday begin at 7:30 p.m. and Sunday at 4:00 p.m. Entries include rodeo legends Fred Whitfield and Joe Beaver! This event will also feature the comedy stylings of legendary barrelman and clown Rudy Burns (see picture below). Rudy Burns says hello from a precarious spot. This entry was posted in Bull Riding, CPRA Rodeo, PBR. Bookmark the permalink.